Most of you know that I grew up in Texas. Texas has some of the BEST barbecue, in my opinion. A year after we were married we moved to Pennsylvania and I had a HARD time finding some of my favorite foods like BBQ and Tex-Mex, so I had to start making my own. My mother-in-law introduced to me “Liquid Smoke” and I have been using it for years. 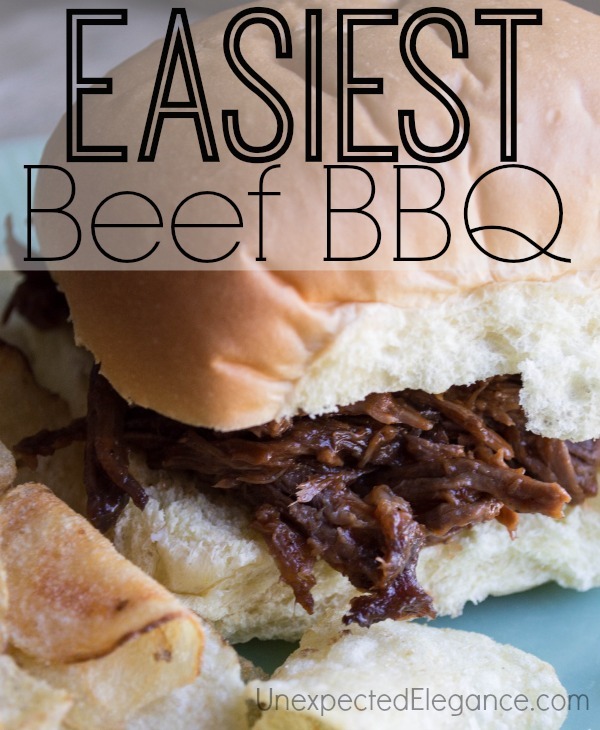 Here’s my recipe for the EASIEST Beef BBQ you will ever make! a bottle of favorite BBQ sauce. Put the meat in a gallon freezer bag and pour the entire bottle of Liquid Smoke over it. Let it marinate for about 6 hours or overnight. 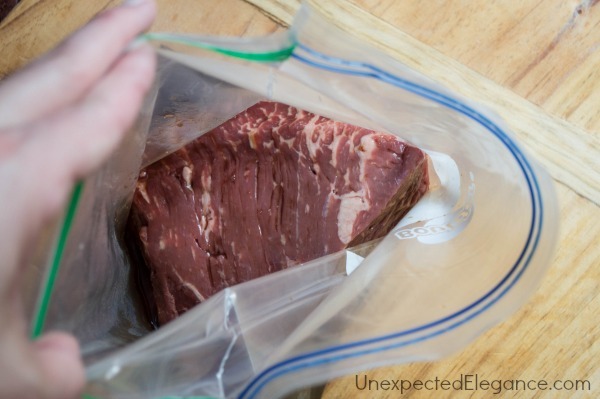 Pour the contents of the bag into a slow cooker with a little bit of water and set on LOW for approximately 8 hours. The meat should be falling apart. Take the meat out and shred it with a fork. Also, clean out the slow cooker of all the juices. 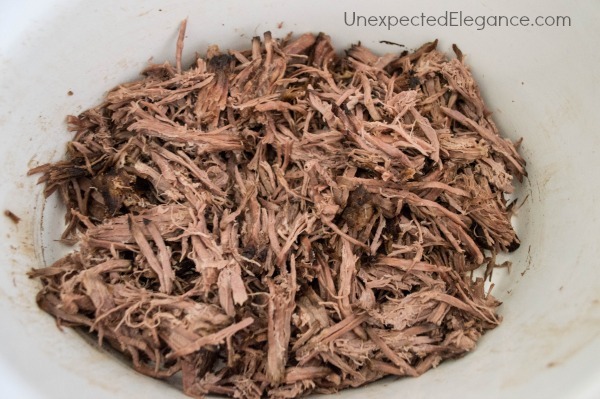 Place the shredded meat back into the slow cooker and lightly coat it with barbecue sauce. Now it’s ready to eat!! I typically use a 2 lb. roast and it makes enough for our family of 4 to have two meals. This is also a great meal for large get-togethers because you can leave it warming in the slow cooker. Take the meat out and shred it with a fork. Also, clean out the slow cooker of all the juices. 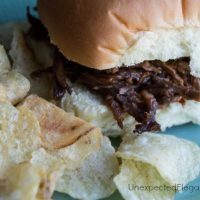 Place the shredded meat back into the slow cooker and lightly coat it with barbecue sauce. Now it's ready to eat!! 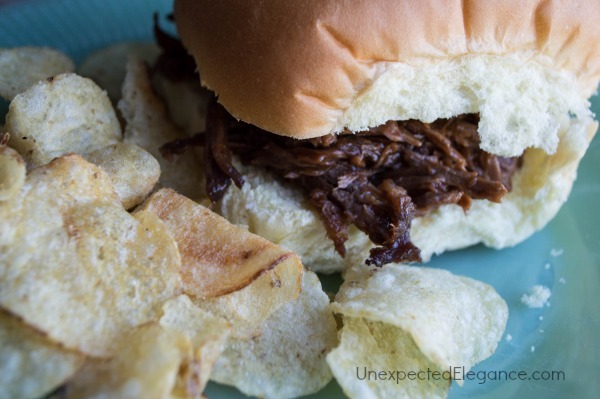 Check out another way to use this EASY Beef BBQ by making BBQ Nachos! I plan to try this soon! It looks so yummy! Hi Angela – trying this tonight…how much is a little bit of water? 3/4 cup ok?? Sorry, I missed your comment! I’m assuming you already made this, but I normally put a half to a full cup. Hi! I took Angela’s beef recipe (sans the barbecue sauce because my boys put barbecue on theirs , but my husband and I like ours plain with just a little yellow mustard and pickles) and added a taco seasoning/water mixture for our leftover night tonight. Served it in warm tortilla shells with all the fixins and it was wonderful!!! My husband LOVED it! Thanks, Jill!!! Glad your gang liked it!